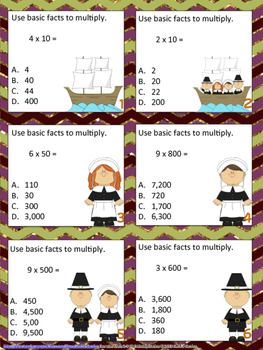 Differentiate your instruction with these fun Fall and Thanksgiving-themed task cards. 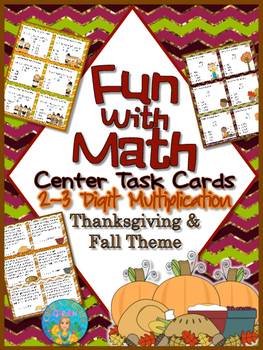 120 two to three digit math task cards for your math center rotations are included with this pack. Your administrator will approve of the varying difficulty levels, and your students will enjoy the bright and colorful graphics included on every card. Use these cards for early finishers or for additional practice. You can assign the entire center or just a few cards. The choice is up to you and the needs of your students. An answer key is included, so students may work independently and check their own answers if you desire, or pull students for small group instruction using these cards. As the weeks pass, simply add to the center with more task card packages. 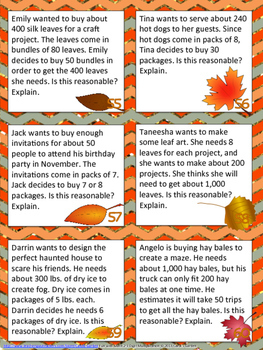 Math Task Cards Elapsed Time Summer "Time"
Click on my store name at the top of the page (Carol's Garden) to see all of these and more! Follow me to receive updates on new products, flash freebies, and sales! This license entitles one teacher to download the product for personal classroom use only. Please do not post the task cards to the internet (even to a class web page) as this allows others to take credit for my work. Thank you!